The sticky things under a cow's tongue are salivary glands, specifically the ventral buccal glands, "buccal" meaning "mouth" and "ventral" meaning "bottom." Far from just making the cow's mouth slimy, these glands play a key role in a cow's ability to chew, swallow and digest food almost no other animals can eat, as well as to chew their cuds. Cows' tongues are a marvel of evolutionary engineering nearly unique among herbivores. Most grazers -- animals who munch plants from the ground -- have clipping incisors. Most browsers -- animals who nibble on tree branches -- have prehensile lips. Some have both. Cattle have neither. Cattle have stiff upper lips and nearly toothless upper jaws. Instead of working to grasp food, the tissues in this area are fused into a bony expanse called the dental plate. Cattle use their gigantic, muscular tongues to grab food by wrapping around it and pulling it into their mouths. They grind it against their dental plates with their lower teeth and control the amount of saliva they add based on consistency, texture and moisture. All this work and unusual oral physiology is in service of the rumen. The rumen is the stomach chamber where the true magic of cow digestion happens. Cattle hold a privileged position in the animal kingdom -- they can survive and thrive on items that are inedible waste to almost all other animals. They break down cellulose into calories. They make their own protein out of simple nitrogen compounds. Though actually feeding some of these products to cattle is controversial, it is possible for them to create a nutritious stew of fats, sugars and proteins from such unlikely sources as grass stems, corn cobs and chicken manure. They do this through microbial fermentation in the rumen. The rumen works because it's filled with microbes. Bacteria, protozoa, even fungi all have communities here. These industrious little guys work nonstop turning what the cow eats into nutrients, energy and the raw materials for growth, reproduction, milk production and, of course, cow manure. The cow's actual nourishment comes not from the feed she eats, but from the metabolic products these microorganisms produce. As the microbes die and slough out of the rumen, they too are digested. In fact, microbes themselves form a significant proportion of a cow's protein intake. When something a cow's eaten isn't readily digestible by microbes, she regurgitates it, mixes it with more saliva and grinds it ever finer against her dental plate until it's something her little friends can handle -- that's chewing cud. The rumen fills most of the barrel-shaped real estate of the cow's abdomen. It holds up to 40 gallons of material at a time. 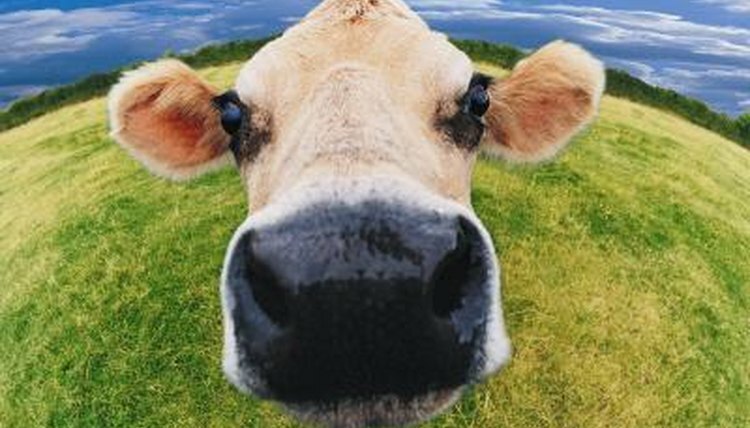 A cow's salivary glands produce up to 20 gallons per day. Do the math -- up to half that enormous volume of cow tummy may be spit. This ocean of saliva buffers rumen pH and gives microorganisms just the warm, wet, briny environment they need to flourish and prosper. It moves the food bolus, or cud, up and down the esophagus without harming or gagging the cow. Overall those sticky things under the cow's tongue keep the whole operation well lubricated and rolling smoothly.